South Africa on their own in two weeks - is to create it? Yes and it is worthwhile in any case, to visit this wonderful country. 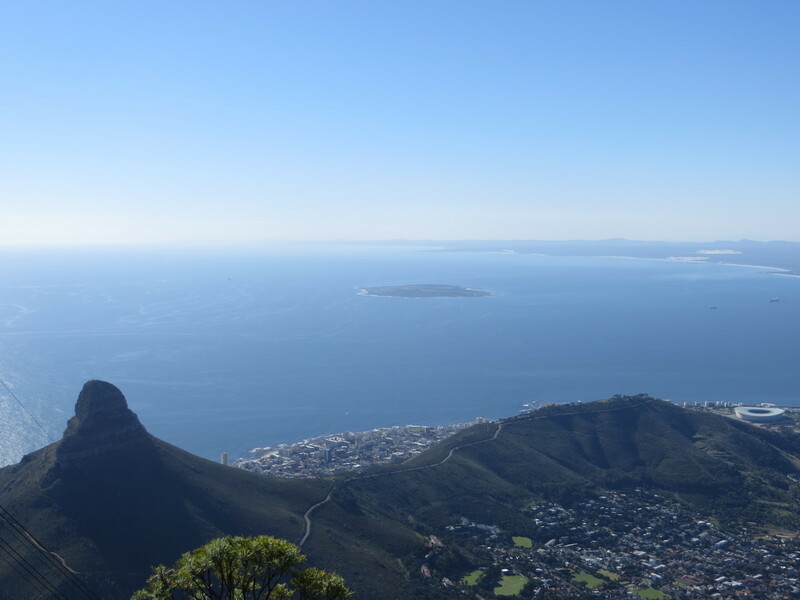 South Africa is one of the most diverse travel destinations: ranging from adventure in the Paul Kruger National Park to beautiful beaches - vast and wild - for every taste is catered for. And just as varied and particularly how nature are also the people: helpful, cheerful and attentive. In everything they are doing, they are present. You can feel that every action has depth. Quick is rarely something, but it is sustainable. Until one gets his breakfast, it may take for example. 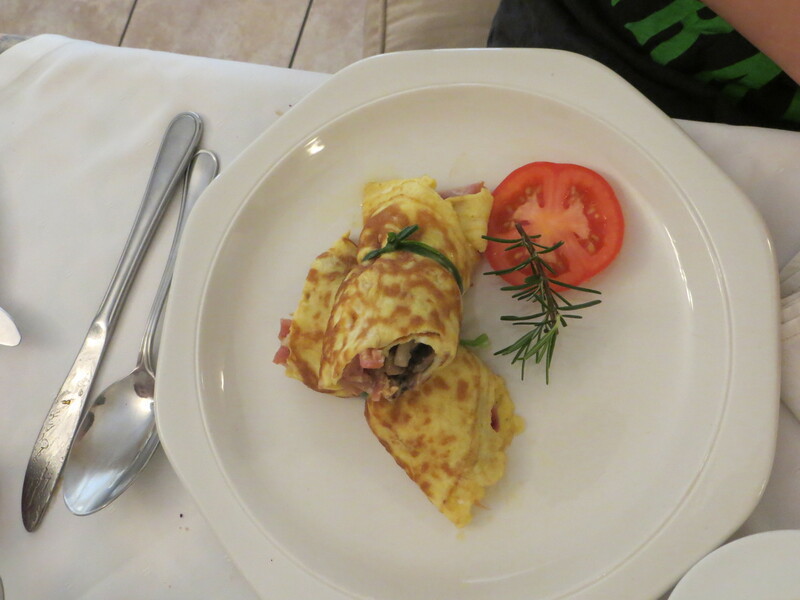 But if then decorated with herbs and tomato omelette stuffed with prawns and mushrooms against a is - of course with eggs from free-range chickens - we know that the wait has been worthwhile. Culinary South Africa is not to exceed. 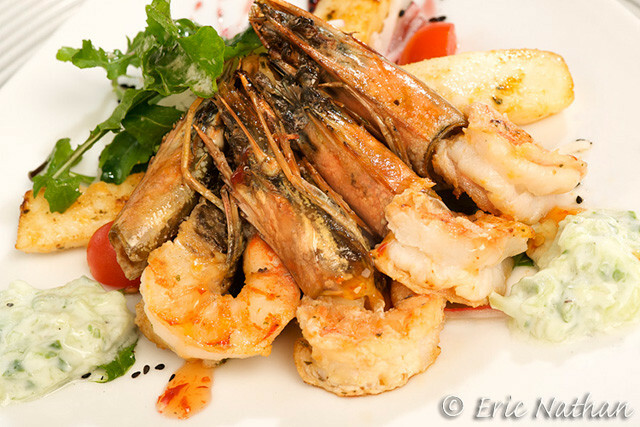 It's not just the food itself, it is also the way it is served and the ambience of impressive restaurants. Here are some special tips for planning your trip. The trip begins in Johannesburg, where you take a car and straight on towards Kruger National Park should go. Important to know: In South Africa, on the left. Safety Tip: Tourists should be arrived after dark at the hotel. At traffic lights and intersections, it is safer to lock the doors - this is also true in many European cities and should not scare you. If you leave the car: always lock. At many parking spaces there are park rangers who look reliable for small money on your car. 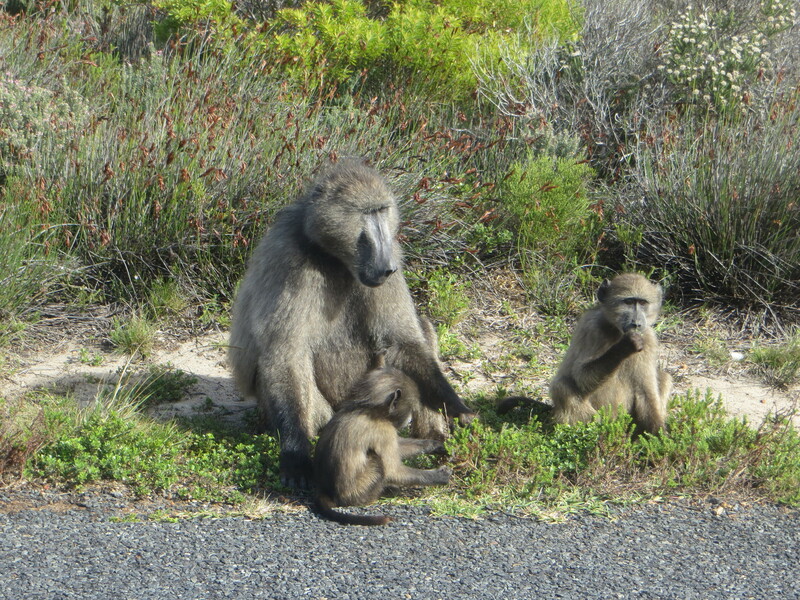 Who does not want stressed in the Kruger Park arriving after the long way, can make a stopover in Mpumalanga. The car goes in this first stage over 280 km. A navigation device is worthwhile in any case, so you can enjoy the beautiful nature and the special light despite car. 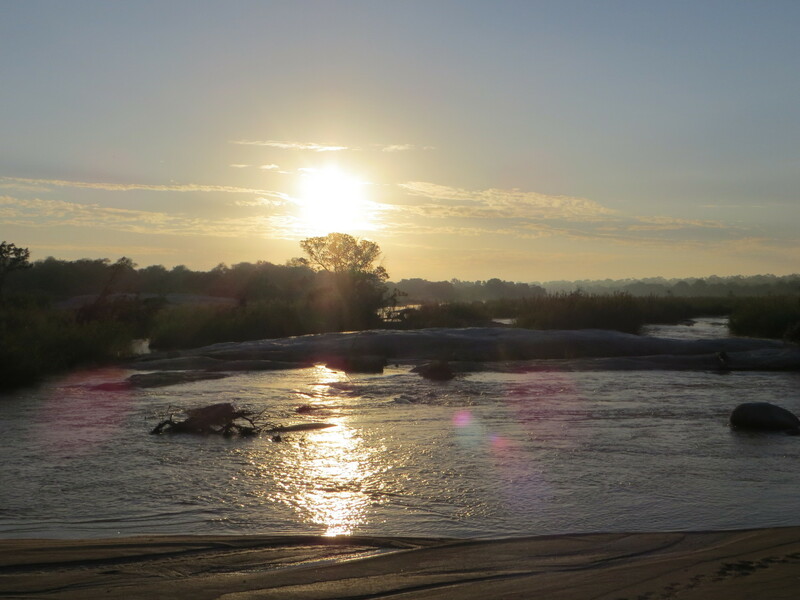 Surrounded by a beautiful landscape you can relax and recover from the rigors of travel before you start the next day in a great adventure and the Kruger National Park drive (190 km). Depending on where you travel and when you travel, malaria prophylaxis is recommended. Information on these matters at the Institute of Tropical Medicine in Germany and also with rangers on site. 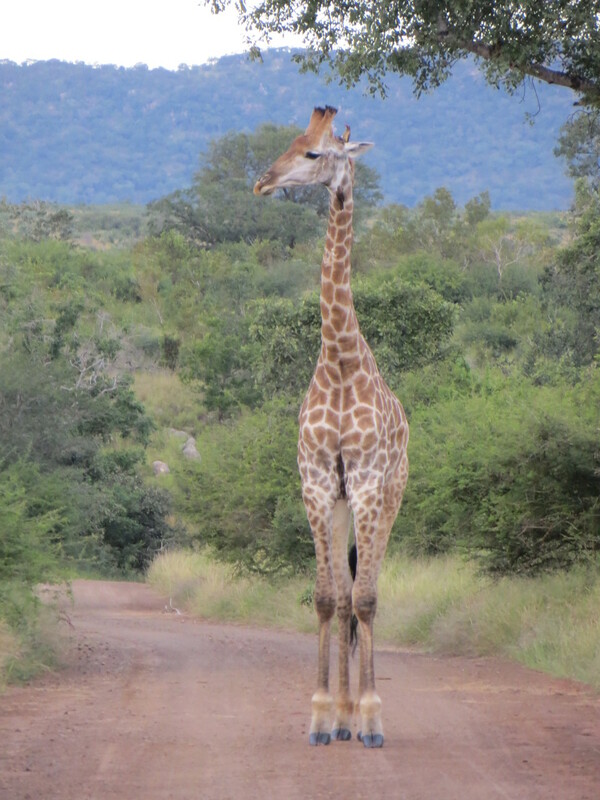 There are several gates, through which you can go straight and to the Kruger Park. If you stay Lodge in below proposed private, the driveway provides over the Numbi Gate. 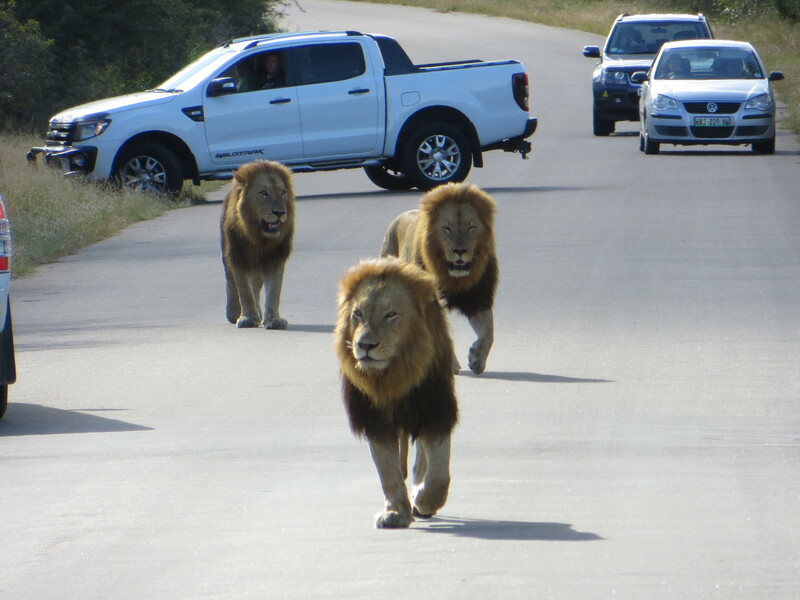 Important to know: In the Kruger Park, the animals are sometimes on the road. Then you have to wait until the road is re-enabled. 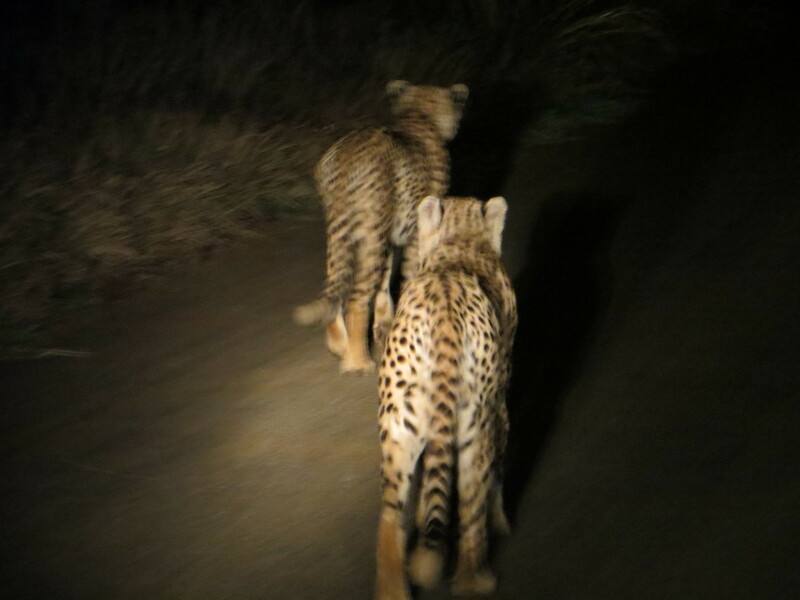 Additionally, you should keep the windows closed, never go, so from a lodge, leave the car, make no hectic movements when animals are in front of you and not cry hysterically. The animals live in the wild, they are not tamed. 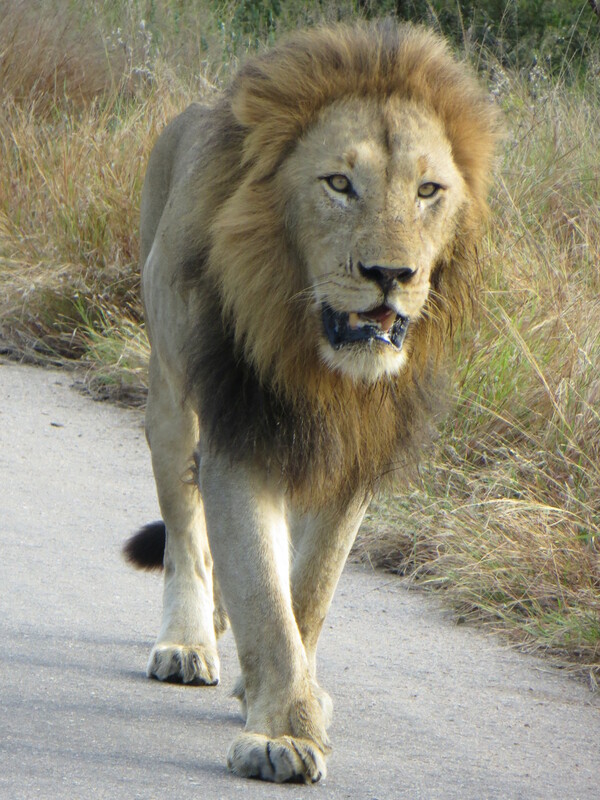 Elephant, buffalo and lions or other big cats can be dangerous if you feel threatened. The park itself is state-subsidized private lodges and lodges. 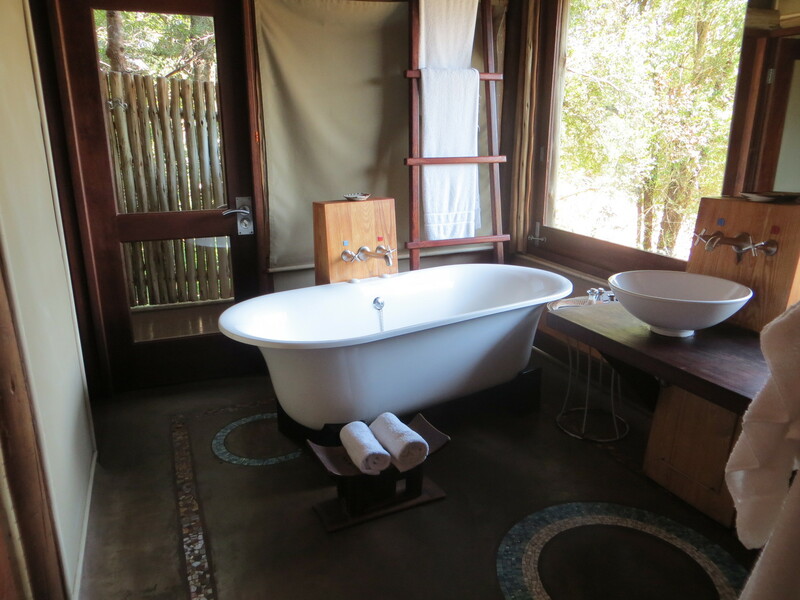 The private lodges are a bit more expensive, but the safaris offered there are individual oriented. 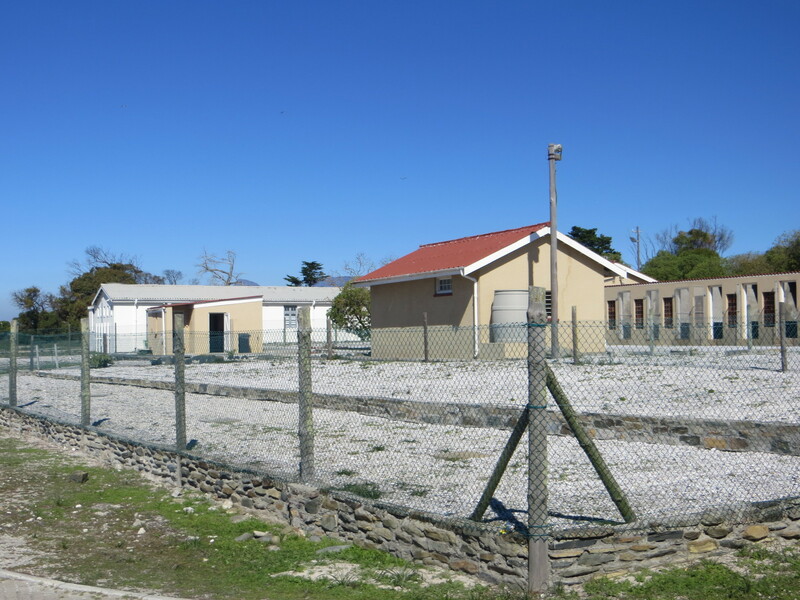 This accommodation can not be beat. The chalets are unique and if there is a South Africa-feeling, then you can feel it here best. They sit on your porch and look at the dried up riverbed Mutlumuvi. 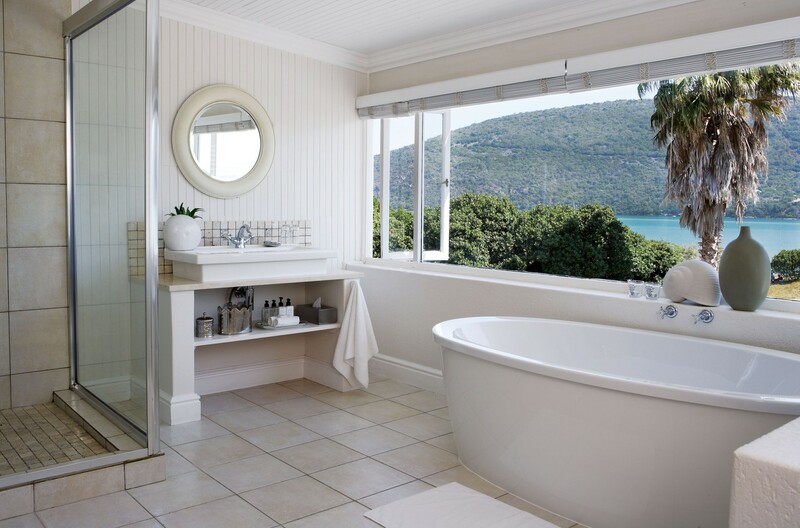 The same views can also be enjoyed from your nostalgia bath, which stands on a small loft. 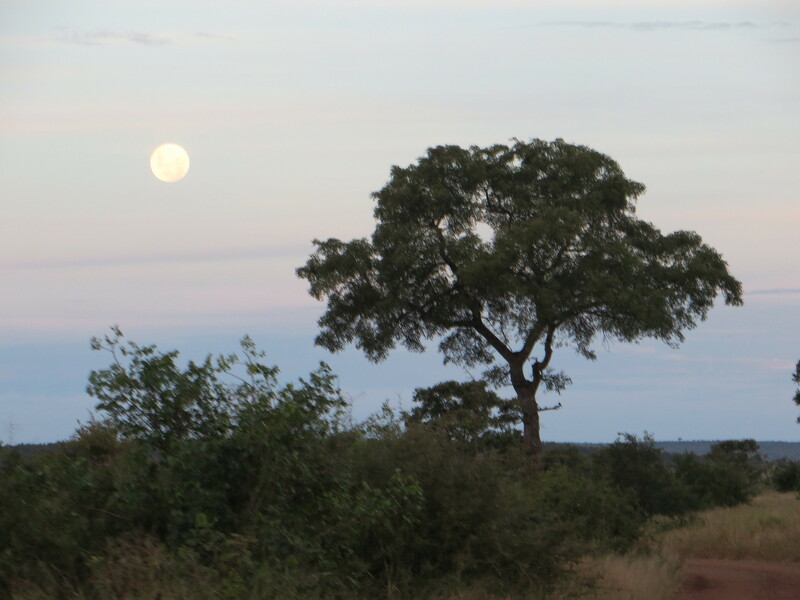 At dusk, you can watch with a bit of luck during bathing animals, sometimes elephants, lions sometimes. 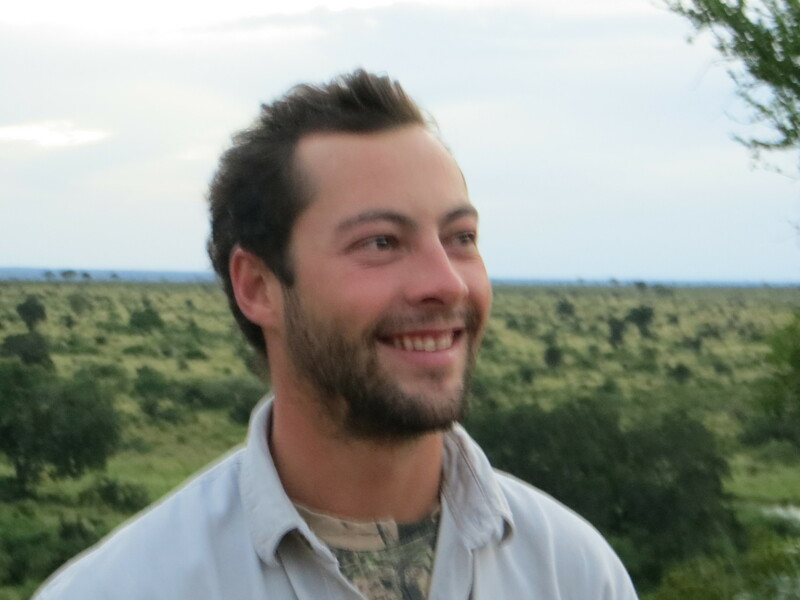 Joey, the young farmer, accompanied with two other rangers guests on safaris that take place at 6 clock noon and from 15.30, which varies a bit depending on the season. He loves nature and animals. "My goal has been reached, if I can inspire my guests from my world." So Joey says the feeling that one experiences when a lion is five meters away from the SUV, or if an elephant crossing the road with his baby, or when a leopard suddenly stands before you. 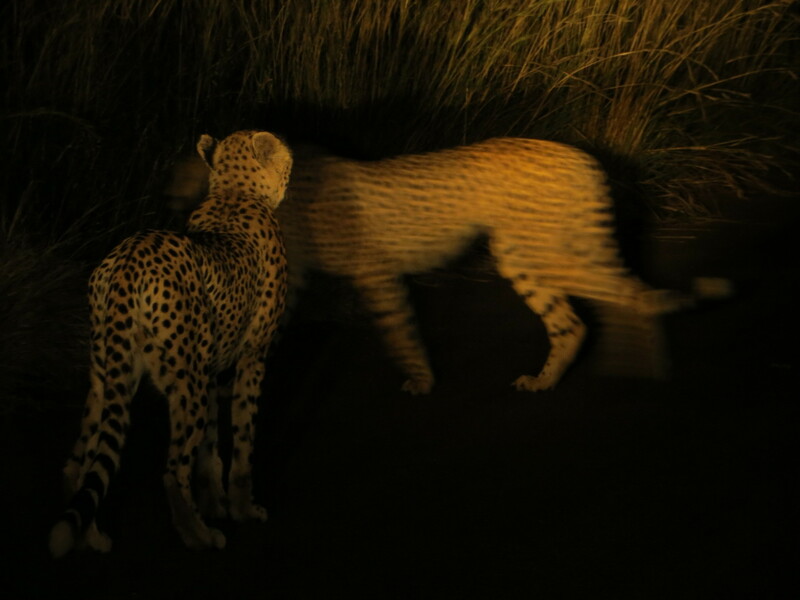 And after the safari in the afternoon then meet for dinner. A long table is available for the guests of the house and the Ranger. After dinner you can - if the condition still not enough - drink a nightcap at the bar outdoors, and be impressed by the incredible adventures of the Ranger. And now and then you can see in the background a lion crossed the dry river bed. There are incredibly intense moments that you experienced here. It's worth it to stay at least three days. 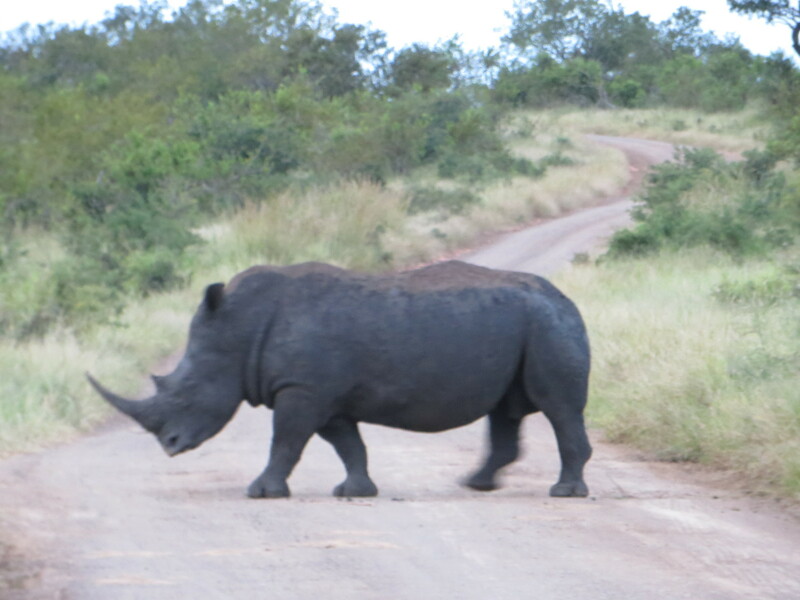 After you are now safari experience, it is no problem to drive on your own through the Kruger Park. 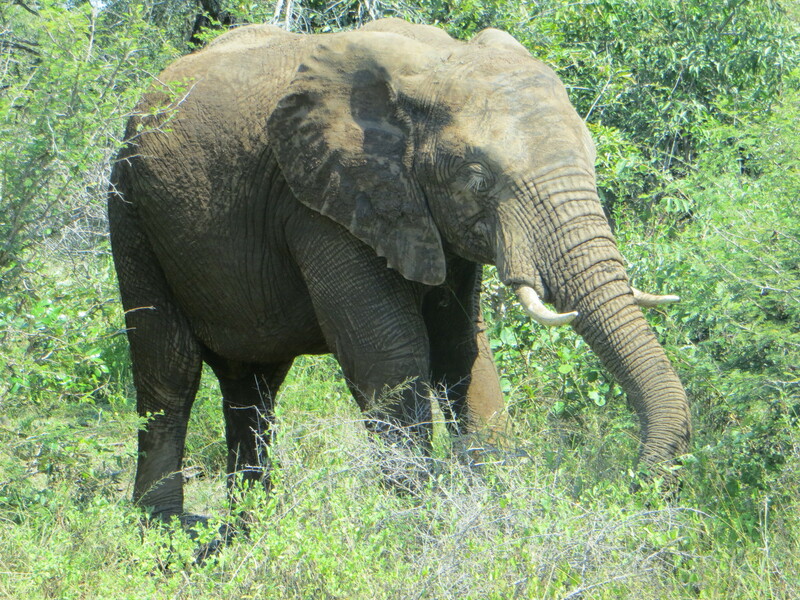 The experience of watching the Big Five without the protection of a ranger, you should not miss. 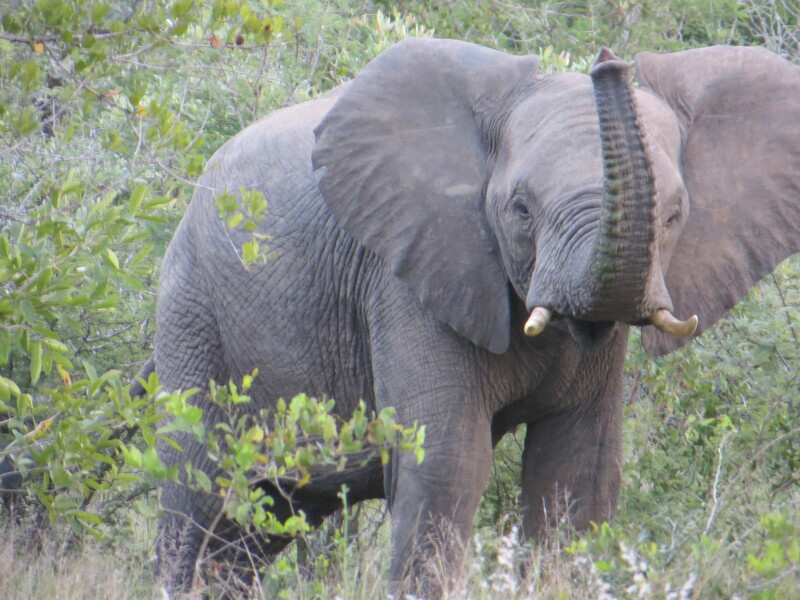 The term "Big Five" refers, in Africa the lion, leopard, buffalo, elephant and rhino. The name originates from the time of the big game hunters and is not related to the size of the animals, but on their dangerousness. 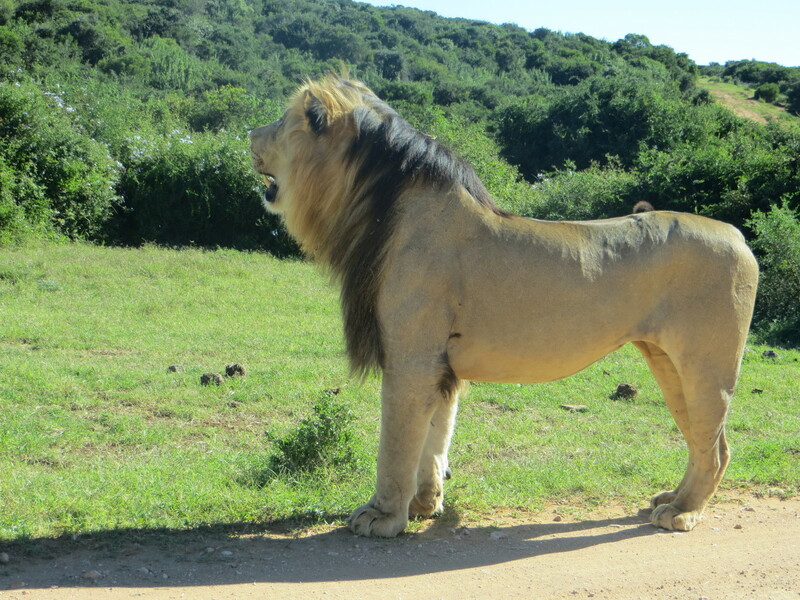 Lions, leopards, buffaloes, elephants and rhinos that you should pay on a safari special respect therefore. 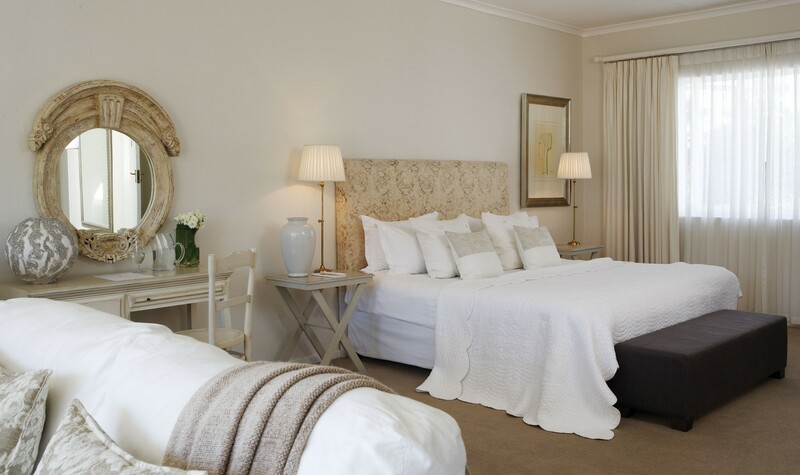 It offers itself to stay after leaving the park again, as the journey to Johannesburg can take five to six hours. We stayed here as it were in a hut on stilts, the walls are tent walls. 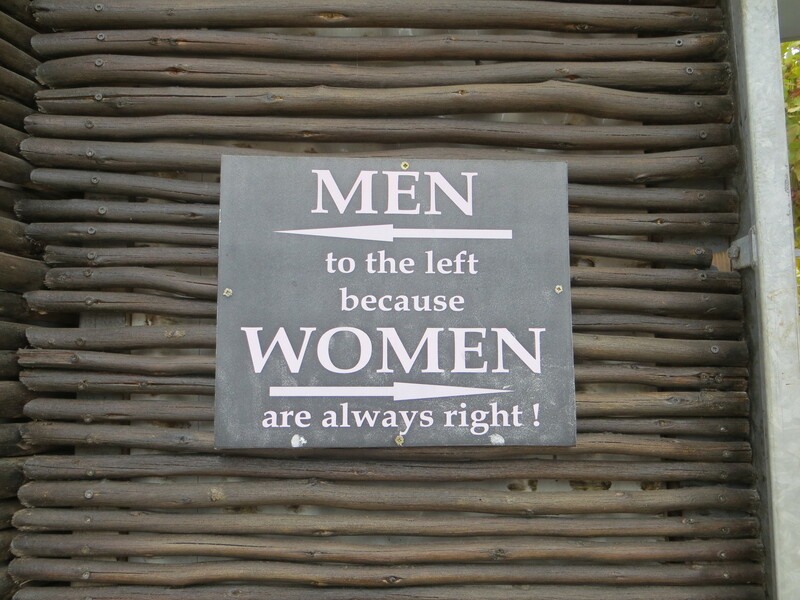 There are, depending on the weather per safari tent both an outdoor and indoor bathroom one. In the dining room there is an excellent buffet, and in the garden you can have fun at the swimming pool again right. The journey to Johannesburg takes about five hours. At the airport everything is perfectly organized, hand over the car and the navigation device, and that was it. Now it goes to Port Elizabeth, where a very different South Africa takes the traveler into its spell. The hotel is not far from the airport, it is located in close proximity to the sea and 50 meters away there is a shopping center with numerous restaurants. There are also excellent seafood. 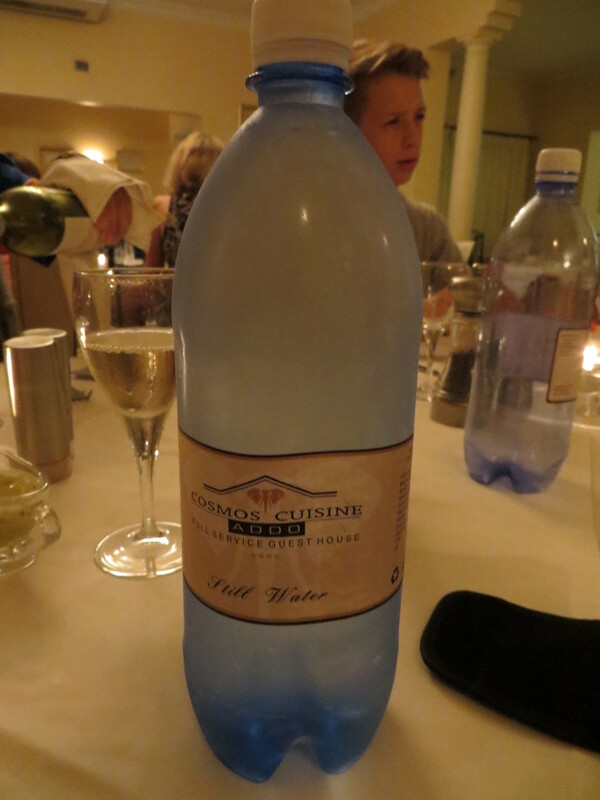 Generally the food is not only excellent in South Africa, it is rather excellent and still low, as is the wine. Culinary this country has much to offer. 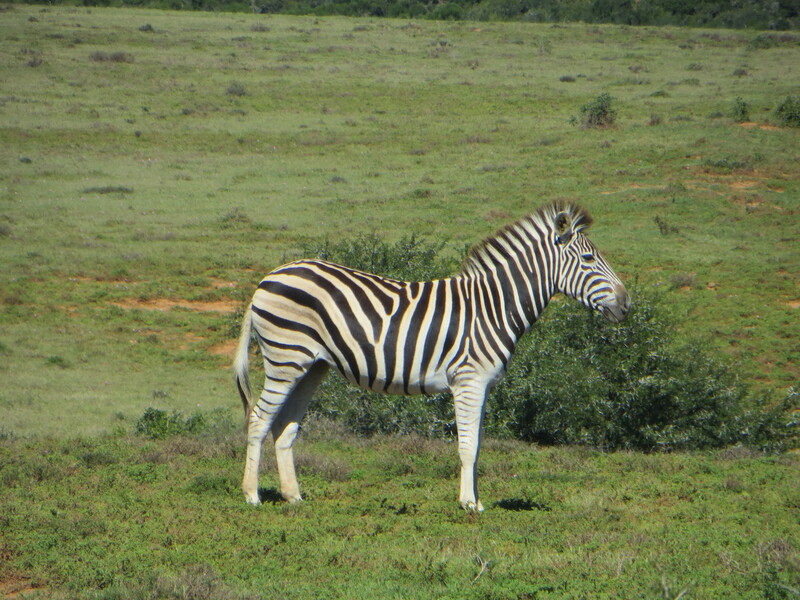 Compared to the Kruger National Park Addo Elephant Park which is relatively small. 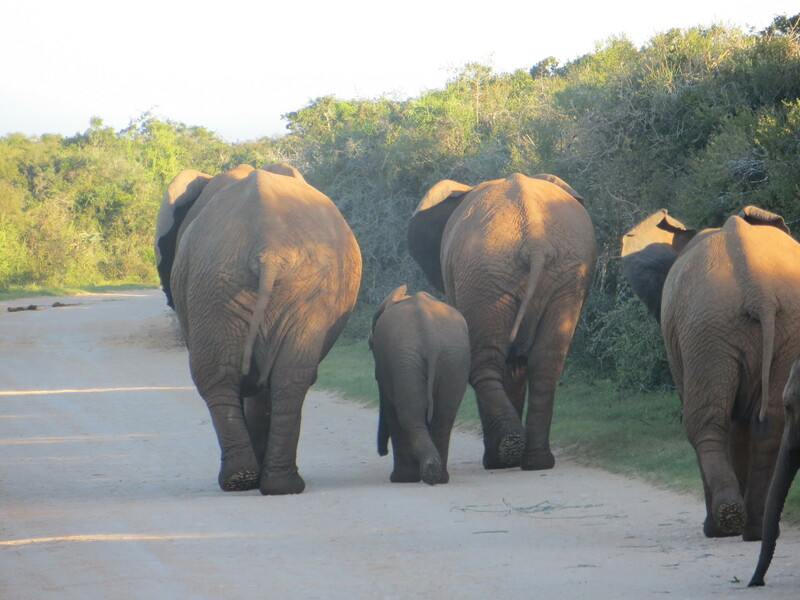 Well worth a visit anyway, because here you can on your own to experience the Big Five up close. After closing the gates by 18 clock you can enjoy a delicious meal in the Guest House Cosmos Cuisine. The rooms are extremely spacious and with attention to detail, even the kitchen leaves nothing to be desired. 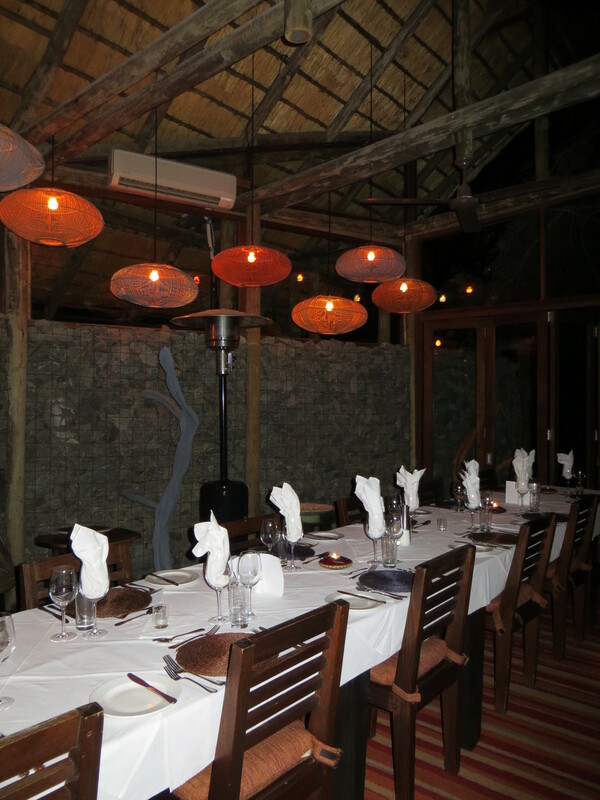 The restaurant is one of the twenty best in South Africa. It is only available to overnight guests. "We want to keep our level and quality that makes us different, we can only offer a small scale. Mass tourism would be our off ", says Lemien de Ridder, the young CEO. And she's right. Dinner at Cosmos Cuisine is truly a special experience. Everything is coordinated in each gear a particular highlight. All dishes come from our own production, even the water is produced from our own source. Coming after such a lovely meal in his room, which is like a suite, surprise the homemade chocolates, the Cosmos Cuisine shampoo ... everything here is authentic and sincere. An absolute must for South Africa travelers. 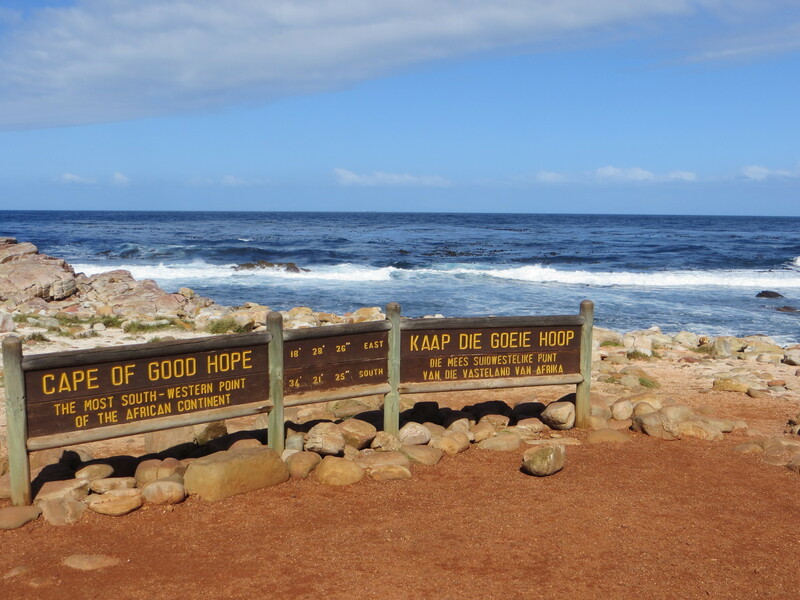 The next stage takes you along the Garden Route. 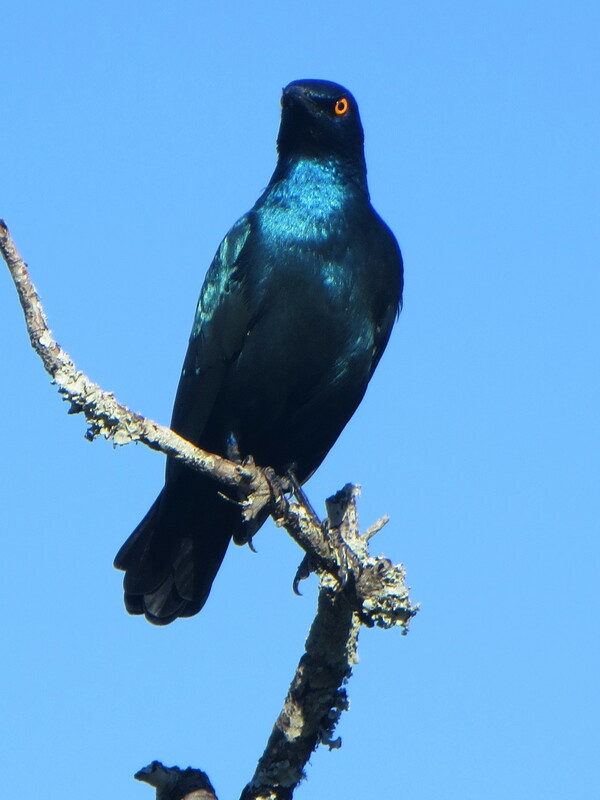 Through the forests of Tsitsikamma, past Plettenberg Bay Knysna until you reached. Those looking for a bit of adventure, you should definitely plan a stop at Tsitsikamma Nationapark and swing with the Treetop Canopy Tours from treetop to treetop. The giant yellowwood trees are partially 50 or more feet high. They swing on a zip line - well secured and also great fun for children - sometimes over a distance of 80 meters from tree to tree. 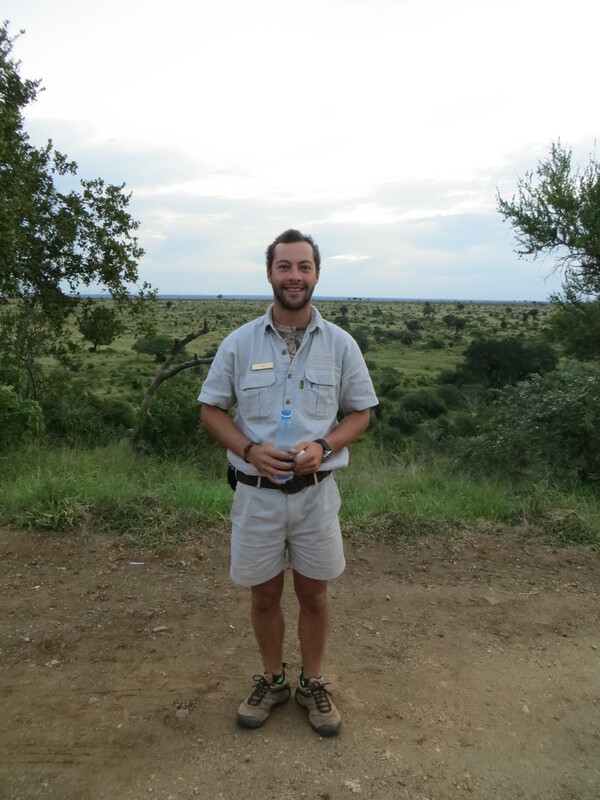 The guides are very friendly and you will be photographed and filmed. For a snack, to which you are invited, you can then look at the photos afterwards and buy, or not. However, there are few who do not want to take home this great experience. 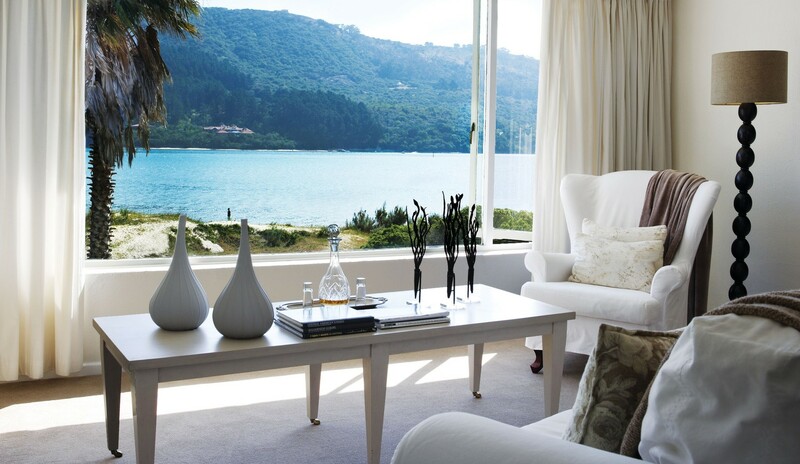 In Knysna arrived, the Leisure Isle Lodge is a very exceptional accommodation recommendation. The hotel leaves no wish unfulfilled. 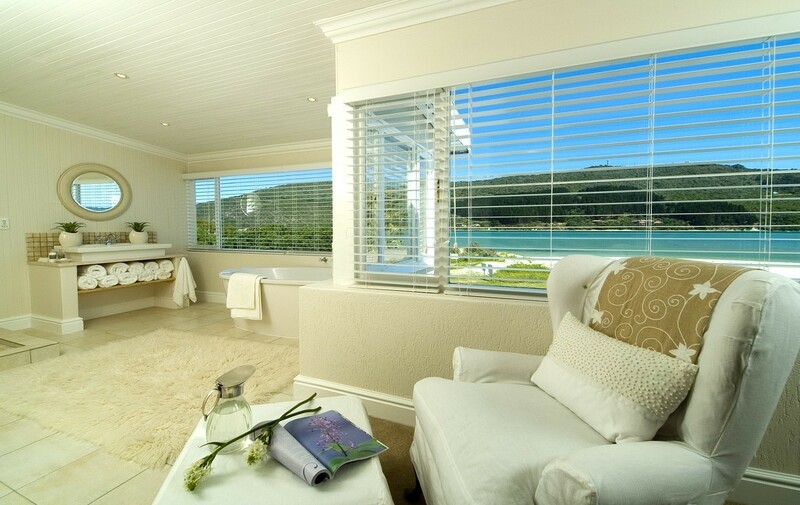 The rooms are luxuriously furnished, the bathroom is huge and the windows facing the lagoon invites you to dream. If you can not relax here, it's nowhere. Even German fashion magazines - current - are ready, if you want to be scattered. 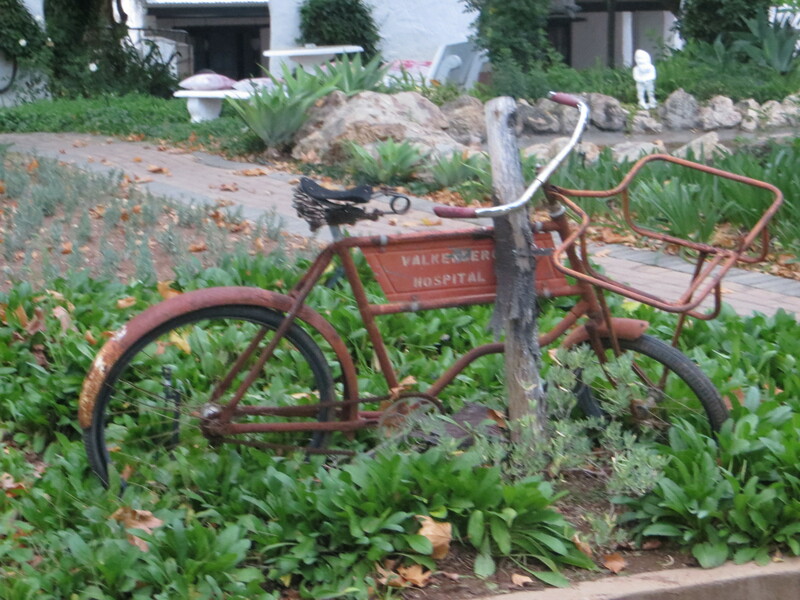 Bicycles and canoes can be rented at the hotel for free and those who plan special trips, asks, "Cher". She gives each hotel guest individual advice. On their sensitivity is reliable. Everyone knows that, not only in the hotel: all Knysna knows Cher. If Cher restaurant recommends and you tell her beforehand what you want, you will experience the perfect evening. If you pay and praise the kitchen, the waiter will ask: "Is it Cher" An extraordinary woman in an extraordinary place. But the other hotel employees engage themselves beyond measure, so that you feel comfortable. Innocent example. He will explain the details in the room: how the blinds work, how you can adjust the lights in wellness and normal lighting, when you can leave laundry etc. And if he is on duty at the bar, you get not only a delicious drink while you watching the sunset, Innocent entertains you with many interesting stories. Whether at the bar or in organizing a shuttle transfers on Pear in Leisure Isle Lodge is read from the lips of your every wish. The runs through until breakfast. The cuisine is excellent. Could not be better. This place would you never leave. It is worthwhile here to schedule three nights or more. There are also great excursions here. I really recommend a dolphin tour. And wonderful also is a trip to Plettenberg Bay and Nature in the front location Robberg Reserve (http://www.capenature.co.za/reserves/robberg-nature-reserve/). Here you will find unspoiled beaches. Sturdy walking shoes, however, are urgently needed, because, depending on the route crosses rocks. You have to be a mountaineer, however. For families with children there is no problem. 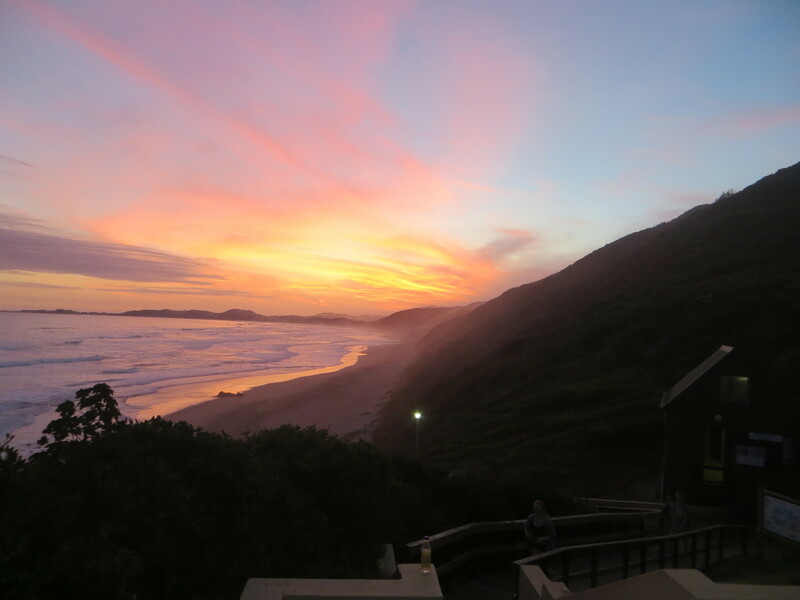 It continues on the Garden Route, initially to the Cango Caves (http://www.cango-caves.co.za/). Here you have to pre-reserve. 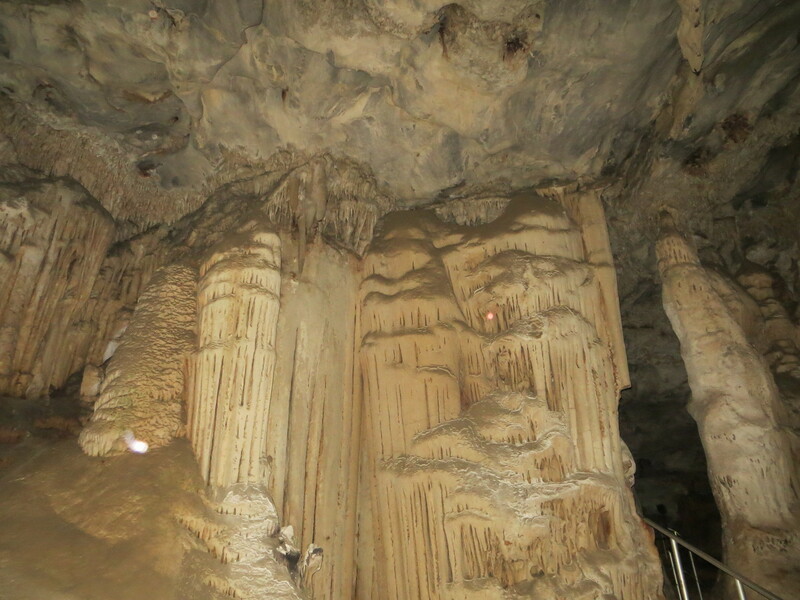 There's the standard tour that quite enough "adventure" offers, and the "Adventure Tour", in which one can come only through small openings in the next cave. Some of you are on all fours on the go is. The standard tour is sufficient perfectly to get a lasting impression. Particularly interesting is a huge cave, which was formerly used as a concert hall. That is mean as prohibited. But if you're lucky, you have a leader, in addition to African songs and the Ave Maria sings perfectly. In this setting, which is an absolute highlight. 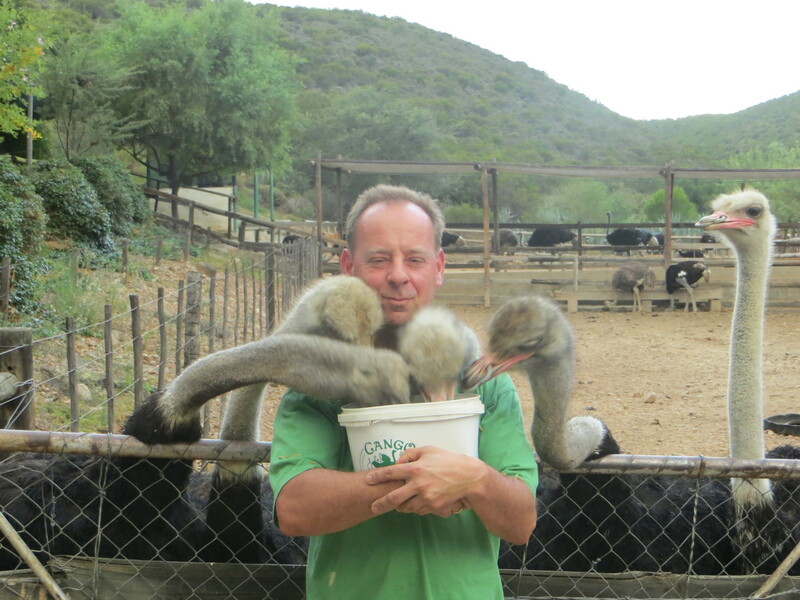 No visit to Oudtshoorn to have visited without an ostrich farm. 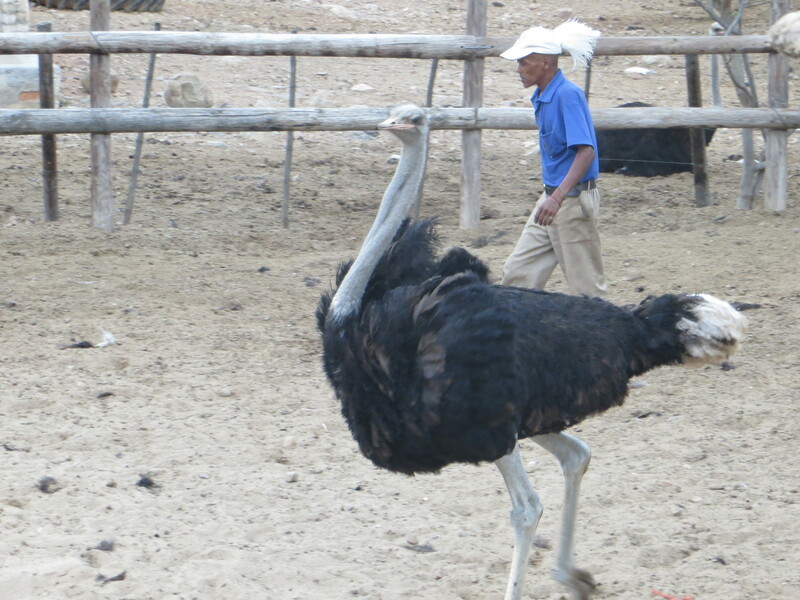 Leading in Oudtshoorn is the Highgate Ostrich Farm. But there are still many others. On some farms can feed the ostriches, you can ride on them, or just admire these magnificent animals. 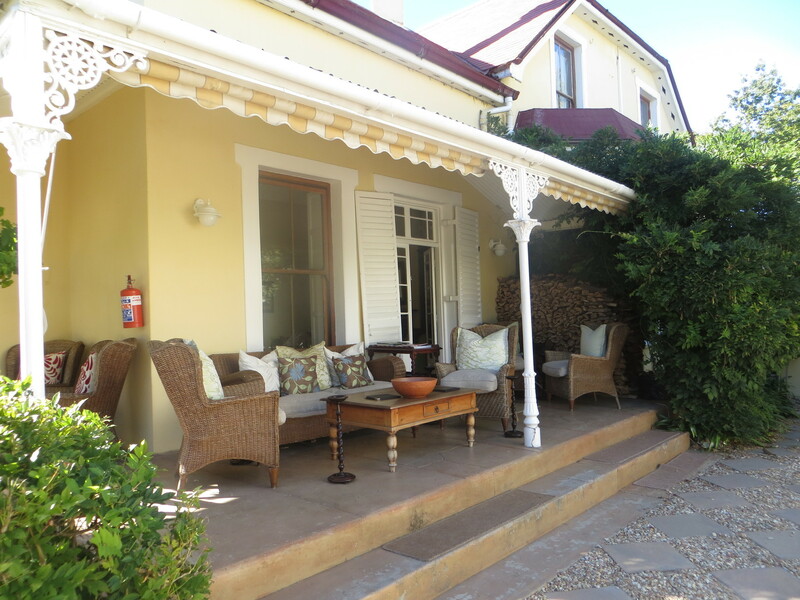 De Opstal Country Lodge invites you to dream. The accommodations are furnished with attention to detail. Tradition and modernity meet. 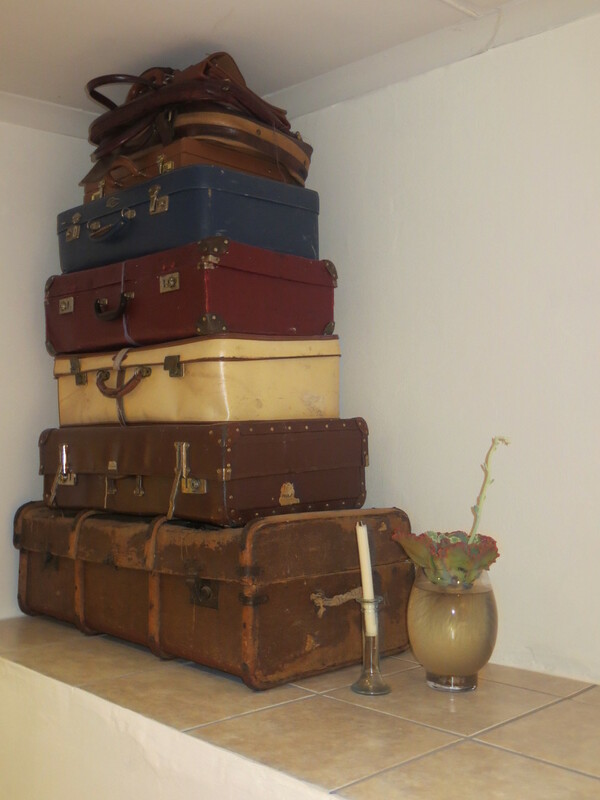 In addition to old leather suitcases, ladies hats, pith helmets or decorated with flowers, bikes, there are, for example, bathroom with jacuzzi. Interestingly decorated horse-drawn carriages, a fantastic landscaped garden - it's actually a park - and a chapel are an ideal setting for family gatherings and weddings. But the restaurant is by decorating already a feast for the eyes. Culinary also a recommendation. The Little Karoo is a semi-desert with a temperate climate. To the north by the Swartberg Mountains and the south by the Langeberg and Outeniqua mountains chain this long drawn level, perfectly embedded and protected. 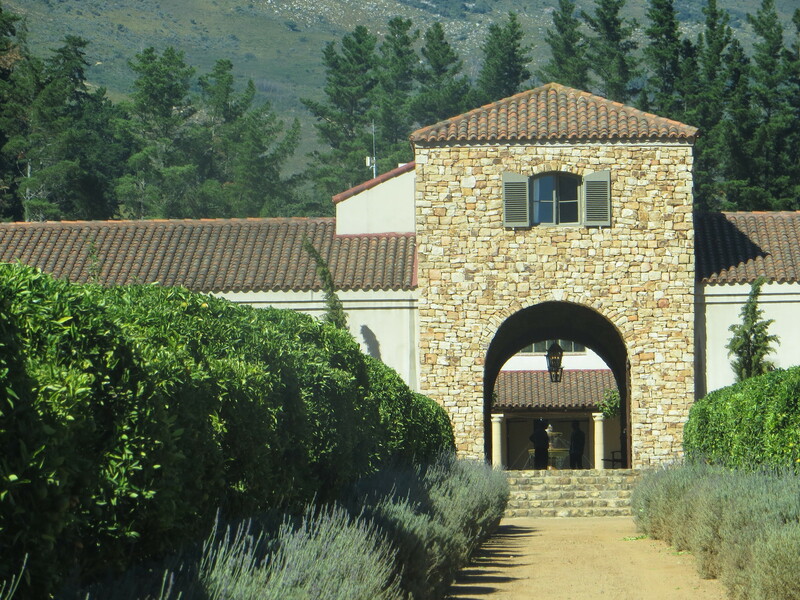 Endpoint of today is the wine growing region of the Breede River Valley. 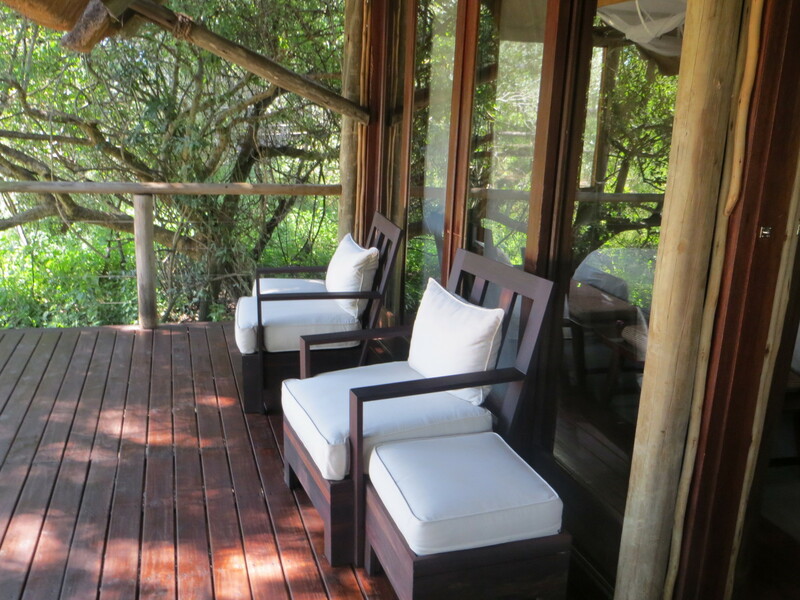 The chalets are very modern, each has its own veranda, huge bathroom and an indoor and outdoor shower. Again, the garden is like a park. Enveloped by vineyards you can enjoy life. The hotel, restaurant and winery run by a Berlin couple. Both partners value authenticity, and it shows. "We always want to remain individual and creative. If we were to expand the restaurant or accommodation, we would be nothing more special. Despite hard work, we have characterized the fun job. This is a luxury you can not afford in any profession, "says Karl. 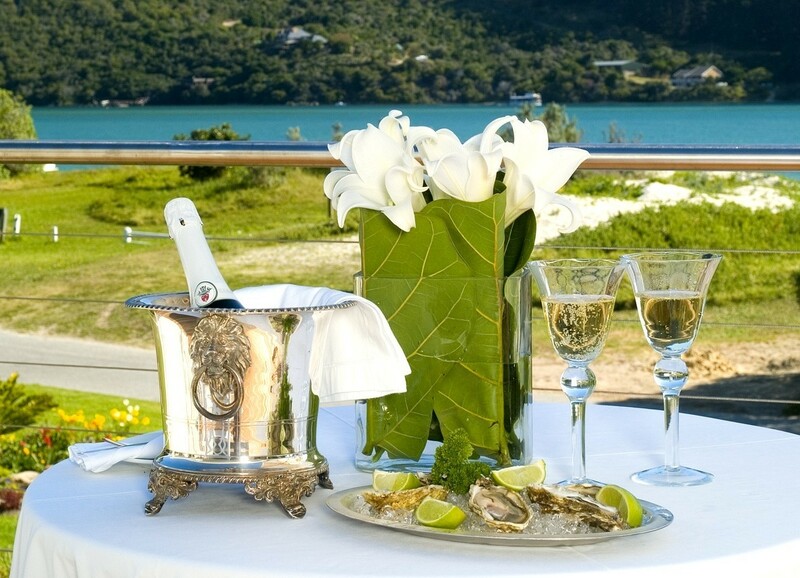 The Garden Route with its wineries is always inviting you to linger. 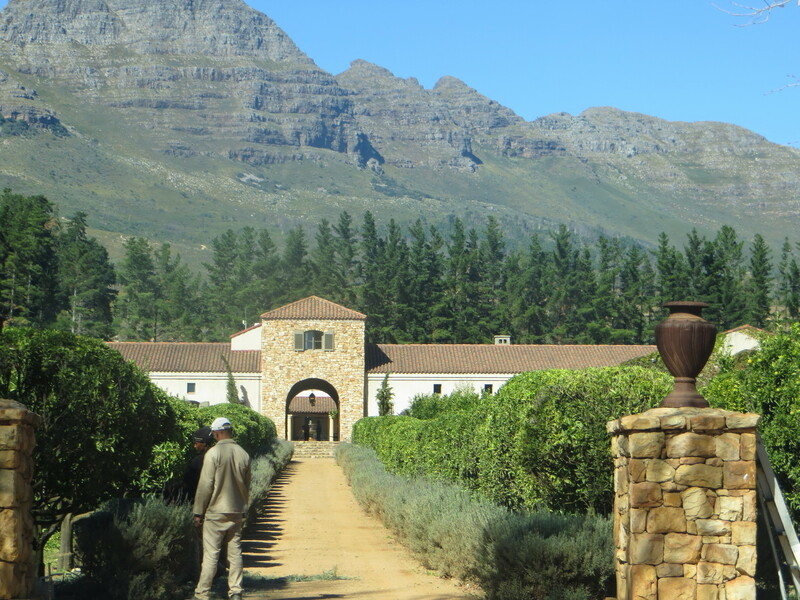 The wineries of Franschhoek and Stellenbosch are to be compared with European hardly. There are goods in the truest sense of the word. Villas, reminiscent of castles, with excellent restaurants, nestled in parks - who can not find the perfect wine in this atmosphere, it is nowhere. Also this hotel is charmingly decorated. It is centrally located, one is very fast in the center with the numerous sidewalk cafes, boutiques and restaurants where you, again can enjoy a good meal the delicious wine that has already cost the wineries. The rooms at the hotel are generously furnished with XXL bathrooms, of which one can only dream of in Germany. A library of great literature passes the time when the partner takes a luxury bathroom or dabbles in one of the two swimming pools. 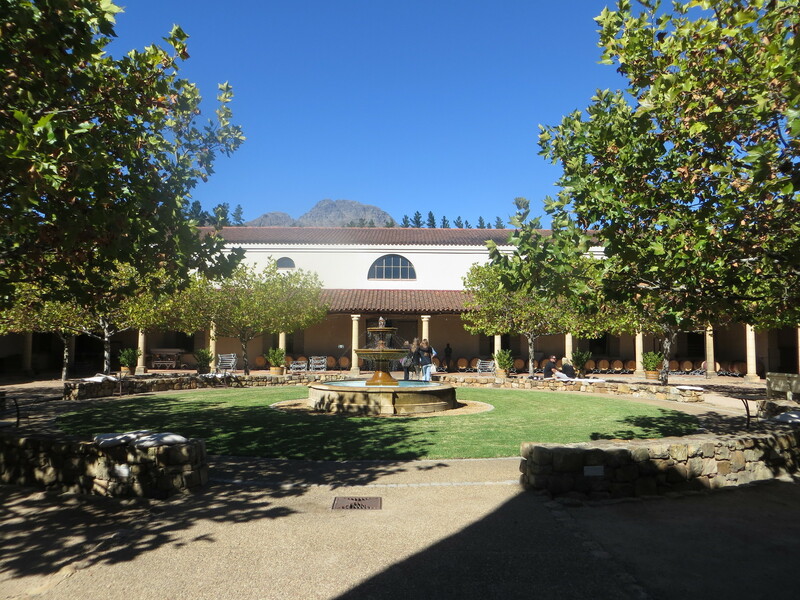 Stellenbosch is a university town, and who after the trip so far has sometimes yearning for the crowds, is the place to go. Continue to Cape Town and at the same time to the last station. The rooms are very modern with a spacious living area. Refrigerator, kitchenette, everything available. Other special features: The hotel is about 100 meters from the sea and the nearest bus stop to the commendable "hop on hop off tour" is about 80 meters away. 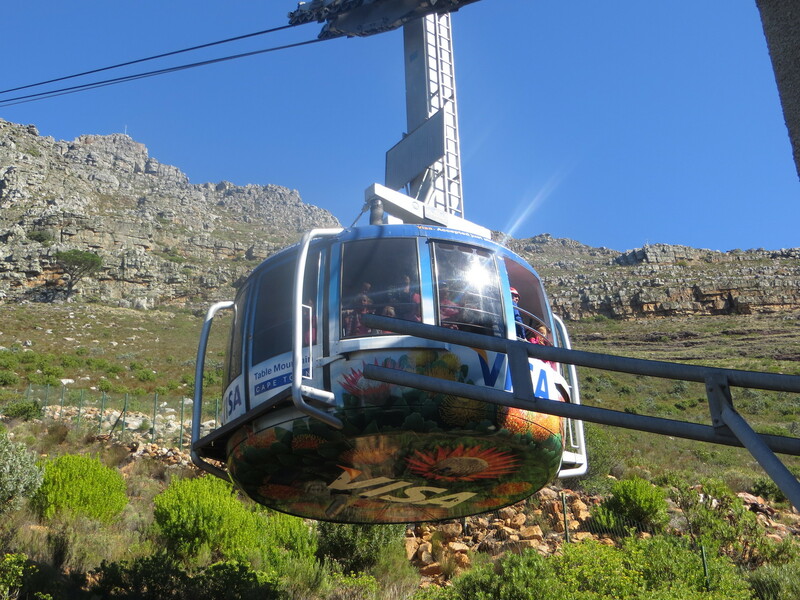 The "hop on hop off" bus goes to the numerous attractions that exist in Cape Town. 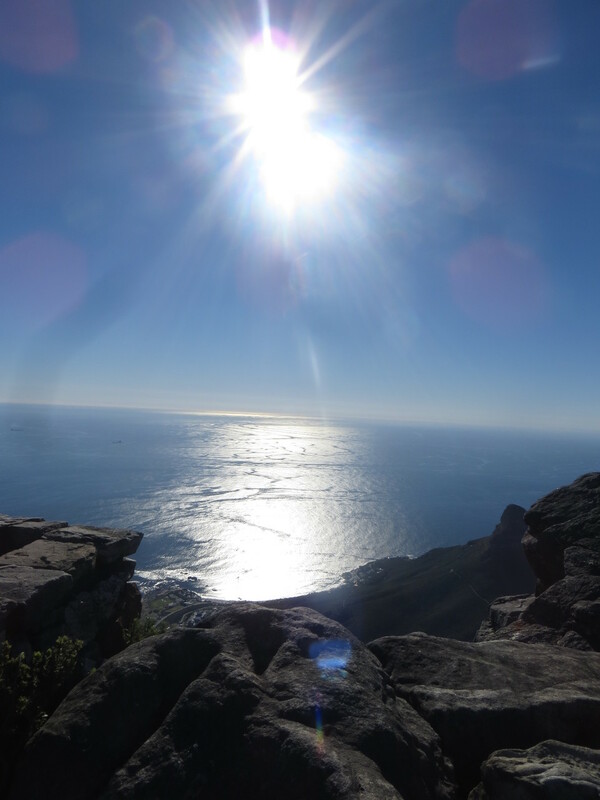 Even the Table Mountain is driven. It is always worth a two day ticket to take everything. Also a must: the visit to Robben Iceland. 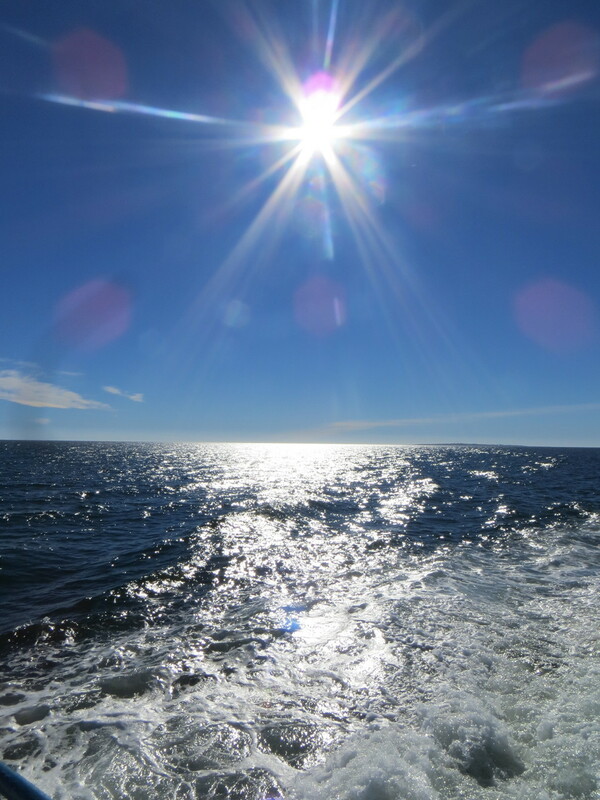 If you're lucky, you can even watch at the crossing by ferry whales. 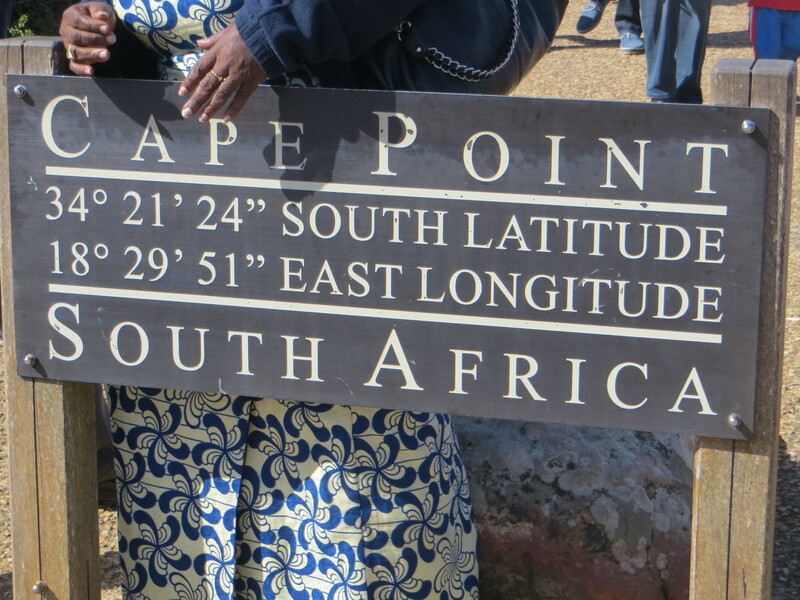 And finally: The Cape of Good Hope, where on a clear day from the vantage point can take a look at the Indian and the Atlantic Ocean. 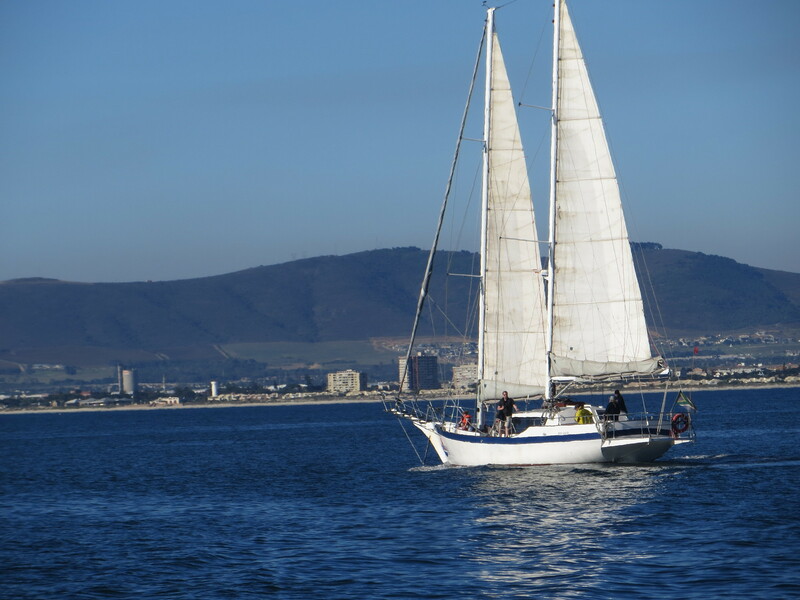 In Cape Town you could spend three weeks, and every day experience new features. Set priorities and do not take up too much before. Plan necessarily also a time to enjoy the country and its people and the wonderful sunsets. Return of the car at Cape Town airport. Farewell to South Africa and flight back to Germany. If you have a longing for this trip, you are not alone. 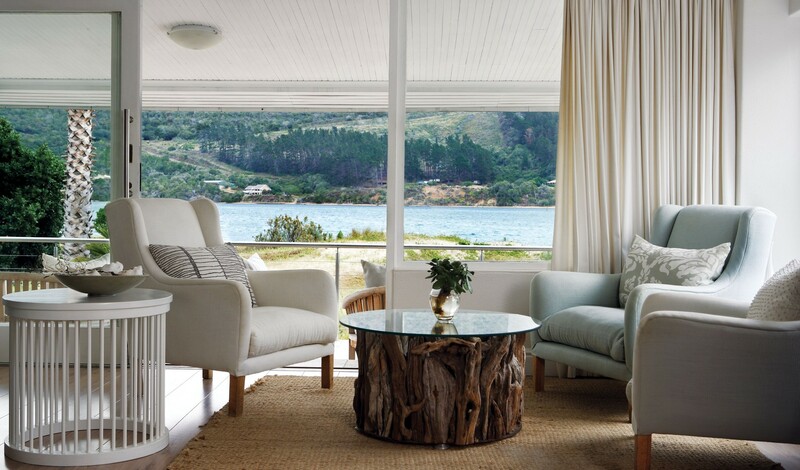 South Africa captivates with its nature, its hospitable and fun-loving inhabitants and his culinary highlights. Curiously, it succeeds very well to slow down and live in the here and now, even if you're staying every night somewhere else. Have fun with the planning! A great support can you quote the Africa expert Barbara Stolzenwald.